We receive a lot of emails about the tools we use to make our games, so we thought it’d be easier to just list them all here for you curious folks out there. We mostly use Photoshop for UI work and everything “branding” and “marketing”. It’s obviously a standard, so no news here. One trick we use a lot is “Generate > Image Assets”, which automatically exports all your layers to PNGs if they’re named correctly. You can also customize the size, quality and file type of the exported image. It’s magic. We also use Transform Each by Kamil Khadeyev, a free and super useful addition to Photoshop. It lets you transform multiple layers at once individually, instead of as a group. We use Illustrator every time we need to come up with a new logo, either for one of our games or to refresh the Juicy Beast one (for the 100th time). We occasionally stray from Illustrator for a more hand drawn look, like with the Knightmare Tower logo and Toto Temple Deluxe logo, but even then, we start in Illustrator to sketch things up quickly, as it tends to handle type more easily than Photoshop and Flash. We use Premiere Pro and After Effects for all of our video trailers. One thing that’s really useful is the “Dynamic Link” between the two softwares. It lets you embed an After Effects composition in your Premiere timeline without the need to render it first. You can edit the sequence in AE, save, and bam, it’s up to date in Premiere. More magic. We used to use our own Flash to Unity exporter, but we’ve been using GAF a lot lately. It renders all our art and animations to sprites and data, and then reads it back inside Unity. 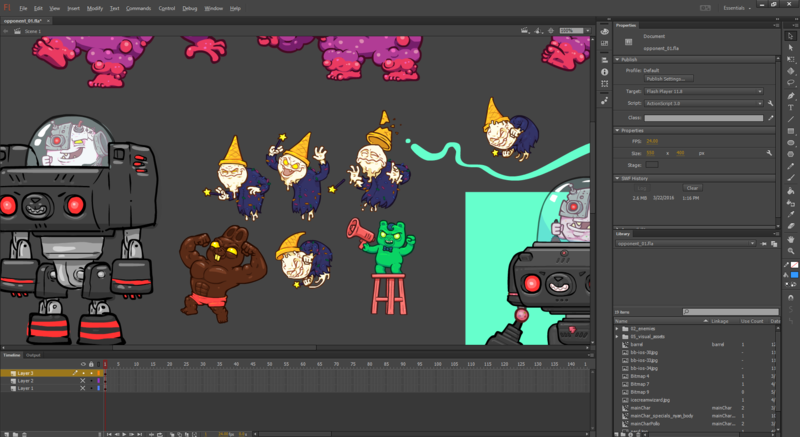 Basically, it lets us animate everything we want in Flash, like we’re used to, and magically pushes everything to Unity! We use it for both character animations and UI animation, like the opponents and the piñata from from Burrito Bison: Launcha Libre. You can read more about the process here! No surprise here, we use Unity like a lot of other devs and probably for the same reasons. The ability to port to multiple platforms without rewriting the code is a huge plus for our small team. 2DToolkit is a plugin available on the Unity Asset Store that we use primarily to manage all our sprites and frame by frame animations from Flash. It’s a very powerful tool if you’re doing 2D games that are not based on skeletal animations. If that’s the case, you should look into Spine. We Alex has been updating and maintaining and upgrading our own framework for years. It’s made our lives a lot easier by letting us do complexe things really quickly. It has a complete event system with built-in game state management, built-in optimized pooling system, easy UI building and management, and a lot of other useful things we won’t list here. Also, as you can see in the image above, we’re using Visual Studio (bundled with Unity on PC). Audio Toolkit is a Unity plugin that lets us trigger sounds with a single line of code. It has a bunch of nice features like sound randomization and pitch variations, plus it has great memory management. DoTween is an animation engine for Unity that we use (a lot) to make things move by code. It’s super lightweight, optimized and easy to use. In fact, it’s so easy to use that sometimes it’s easier to tween a value than to change it normally! I2 Localisation is another Unity plugin we use to manage translations in our games. All our text fields are linked to a cell in a Google Spreadsheet, and all we need to do is fill it out to see the results in the game! Did we say we like magic? Can’t beat a good ol’ spreadsheet when it’s time to handle numbers and formulas for balancing stuff out. Another neat tool we sometimes use to figure out a formula from a sequence of number (because they feel good balance-wise) is WolframAlpha. You can enter a sequence of numbers and it will generate a formula to calculate the following numbers in that sequence. Super useful! Align+Distribute is a tiny little plugin for Unity that helps a LOT when it’s time to meticulously place all those UI elements by hand. Until Unity can offer a solid built-in solution for this, Align+Distribute will keep saving the day! That’s it! If you use different tools or know any cool sites, please share in the comments below, we’d love to check them out! I’m a software developer by profession but love all aspects of game design. I have 3 or 4 years of experience in Unity, and this whole page was extremely helpful. THANK YOU for writing this up! Yup, Animate is still a cool tool to draw cartoony vectors. I visit Deviant art for inspiration. thanks a lot! it was helpful. hey guys I was reading through what tools you use and thought I’d mention one that might be beneficial to you. It’s called GIMP “GNU Image Manipulation Program” available here https://www.gimp.org/ I understand you use photoshop but a few tools on gimp might be helpful so I thought i’d pass it along. I’ve used it for some time. By the way I enjoy your games, and thanks for all the great fun! Best wishes! Hi there! Thanks a lot for taking the time to write about this! I just would like to ask you, ok these are the tools but what kind of programming languages do you need to know to pull of games like burrito bison and totta temple? Programming language doesn’t really affect the end result. It’s basically just another tool you use to built you game. Like using Photoshop or Gimp to do a 2D game doesn’t really changes anything, it’s more about how you want to get there and what you like the most!